Delicata squash chili, inspired by Baltimore-based Coconut & Lime blog. 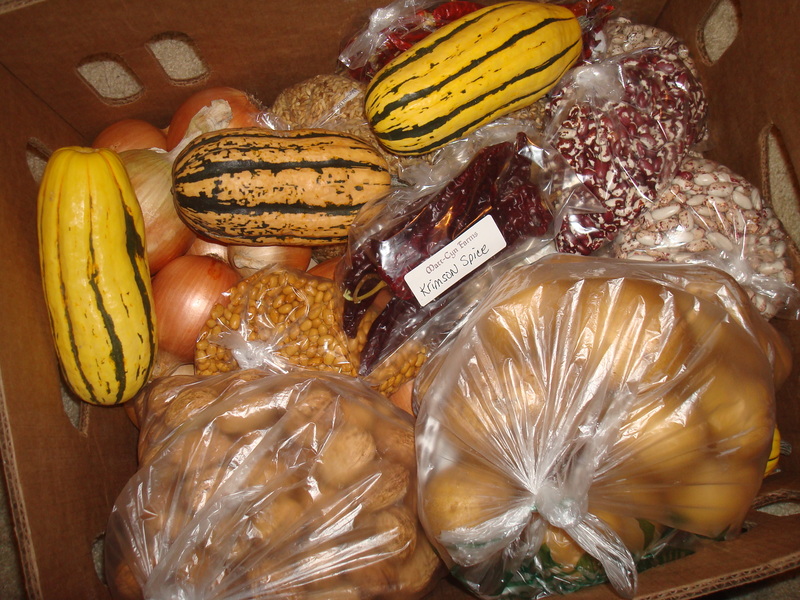 Storage box of winter squash, potatoes, onions, shallots, garlic, beans and walnuts from Matt-Cyn Farms in Albany. I’d never really given much thought to root cellar-ing until we moved out here. In fact, I’d hardly heard of the term. It only conjured up vague notions of root vegetables, giant carrots and daikon radishes and turnips, hanging around in the cellar. But it turns out a root cellar often doesn’t involve much more than storing winter vegetables for several months in a cool (but not freezing) basement or garage, out of the light. This New York Times article, which ran the fall we arrived, is a good introduction to the lost art. It features Portland householder extraordinaire Harriet Fasenfest, who has just published a book (which she discussed on our KBOO Food Show last week!). I’m tip-toeing into root cellar-ing this year. There are mesh bags of potatoes, onions and some apples hanging in the garage. We’ve got dried beans, walnuts and a few winter squash. But we’re quickly eating the supplies up. The new winter storage box offered by Matt-Cyn Farms in Albany this year prodded me to take this step. For $100, HP employees-turned-farmers Matt Borg and Cyndee Ross offered @ a 50 lb. box that included their coveted beans and barley, copra storage onions, garlic, winter squash and pumpkins, potatoes, shallots, English walnuts in the shell, and dried peppers (including Thai dragon ones! ), all grown with their careful organic (but not certified) methods. I finally got to see their enchanting, bio-diverse farm when I went to pick up the box on Veteran’s Day. They grow just about every kind of vegetable under the sun, including lots of rare heirloom varieties of beans and peppers. 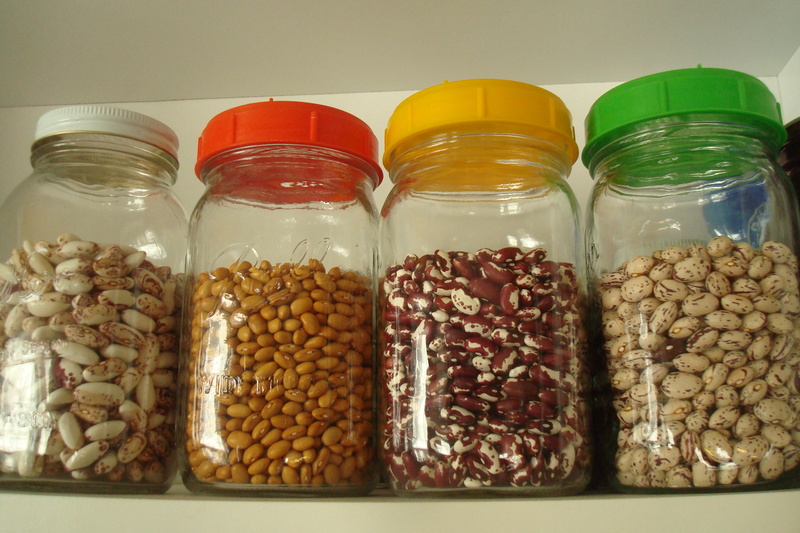 Matt-Cyn beans with vented lids for storage: Snowcaps, Yellow Indian Womans, Colorado Pueblos and Vermont Cranberries. A collage of beans, still so fresh no need to soak them overnight. 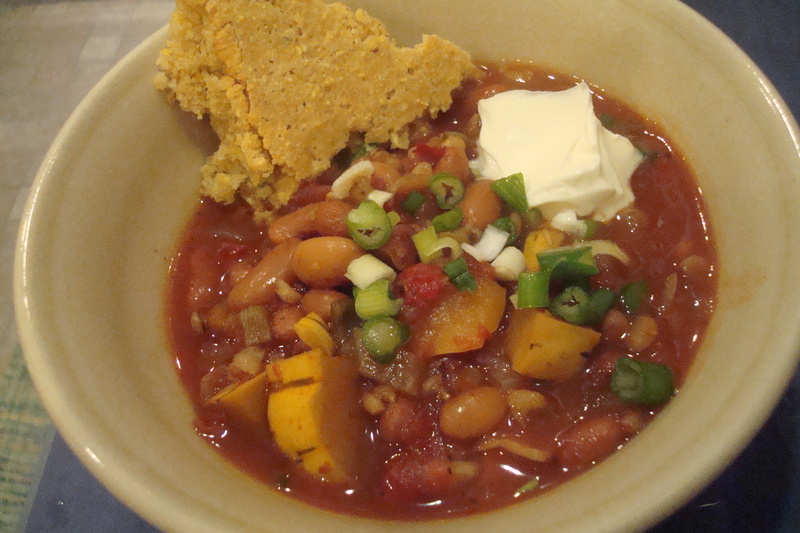 That box sure came in handy for the Delicata squash chili I made in the slow-cooker tonight. I adapted it from the Baltimore-based food blog Coconut & Lime, increasing the amount of beans (and bean broth) and tomatoes used and omitting the questionable liquid smoke, substituting smoked sea salt from The Meadow boutique in Portland instead. I also threw in Matt-Cyn Farms barley (instead of rye) to make a complete protein with the beans. And I didn’t peel the Delicata, because that’s one winter squash whose skin is thin enough to eat. It provides good fiber and gives the veggie chili more substantive texture and sometimes crunch. 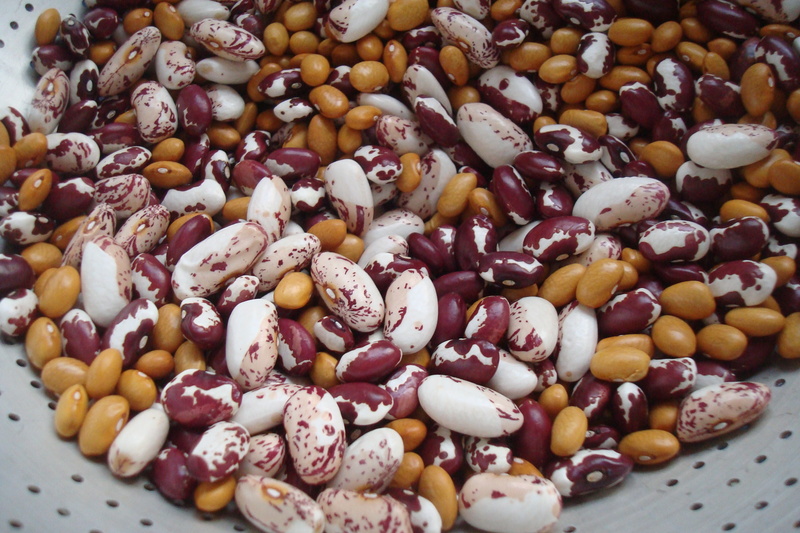 Matt-Cyn’s heirloom beans–Snowcap, Colorado Pueblo, and Yellow Indian Woman (a variety served to Lewis & Clark on their journey West)–really shined in the dish. Snowcaps are a remarkable soup bean that become so plump and creamy when slow-cooked in broth. The only problem was the chili, spiked with dried chipotle, and fresh poblano and jalapeno, was a tad hot for our guests’ tastes–I tend to forget we enjoy spice more than most. But that was nothing a little creme fraiche and shredded cheddar couldn’t mellow. We served the chili with green onion-and-fresh corn-studded Mexican cornbread (minus the cheese) from the Moosewood cookbook. It was thrilling to find still-sweet fresh corn at the last Saturday market of the season Saturday! The cornbread was a tad dry and crumbly, perhaps because I used whole wheat flour? But still tasted yum mixed into the soup. I’m finally embracing the power of the slow-cooker, that once-underutilized wedding gift that’s now among my most-treasured appliances. It’s so nice to have the meal cooked and warming on its own when your guests arrive. Less last minute scrambling in the kitchen. And I’ve barely scratched the surface of what you can make in slow-cookers. Coconut & Lime (and perhaps the blogger’s healthy slow-cooker cookbook) is a good place to start. Wow, looks amazing. I can’t wait to make it this weekend.